Studio 6a Salon & Spa on Westwood Road in Westlake. View Image Gallery After years of working at a bustling westside salon, stylists Nicole Gilsdorf and Katie Klein decided to start their own business. The settled on a cozy location on Westwood Road in Westlake, officially opening in January to their existing clients. After more than six months styling the hair and nails of loyal customers who followed them from their previous salon, the pair have recently begun accepting new clients. 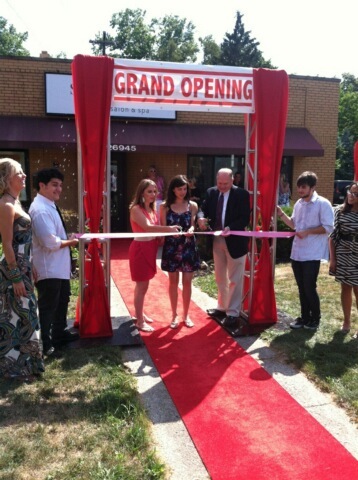 Studio 6a Salon & Spa held a ribbon-cutting ceremony July 25 with special guest Mayor Dennis Clough. The boutique-inspired salon offers haircuts, color, highlighting, manicures, pedicures, shellac and makeup. The intimate space features a lounge, coffee, wireless internet and a friendly environment. The stylists take pride in “unparalleled service, technical excellence, expert advice and practical professionalism,” said Gilsdorf. Studio 6a is open Tuesday, 11a.m.-8 p.m.; Wednesday and Thursday, 9a.m.-8 p.m.; Friday, 9 a.m.-5 p.m.; and Saturday, 8 a.m.-2 p.m.. Walk-ins are welcome, appointments are preferred.